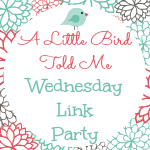 Every Wednesday, I'll working with several other bloggers to feature you. If you link up, you have the chance to be featured on 6 blogs!! But what if you don't blog – how is this party something exciting for you? Well, in this party, you can click around on the links and discover new blogs, new projects, and all kinds of new content. And every week, I'll be featuring some awesome projects from the last week that were particularly great. Since this is my first week, I won't have this feature, but I'll definitely have features next week, so definitely tune in next Wednesday.